This popular classroom assessment tool is a supplement widely used by pre-service and in-service teachers to assess or test students' reading progress. A required component of pre-service training, this practical classroom tool is also used by reading specialists and as a focus for in-service workshops. 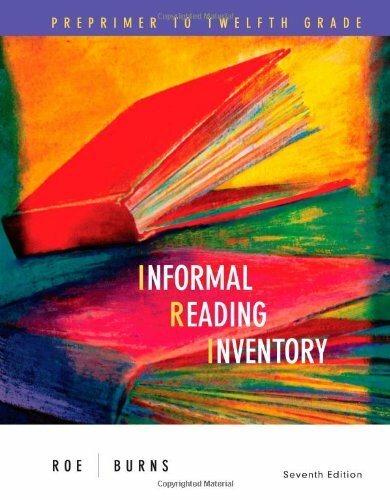 Unique to this text are its K-12 scope and its abundant strategies for assessing students' vocabulary, phonics, and comprehension of text. Betty Roe is Professor Emerita at Tennessee Technological University. She formerly was the Director of the Ph.D. in Exceptional Learning Program and Professor of Curriculum and Instruction. She earned her Ed.D. at the University of Tennessee in Curriculum and Instruction with Reading emphasis. She is the senior author of SECONDARY SCHOOL LITERACY INSTRUCTION, 10th Edition; INFORMAL READING INVENTORY, 8th Edition; and TEACHING READING IN TODAY'S ELEMENTARY SCHOOLS, 11th Edition; all published by Cengage Learning. 1. Informal Reading Inventory: Preprimer to Twelfth Grade Roe, Betty and Burns, Paul C.
2. Informal Reading Inventory: Preprimer to Twelfth Grade Roe, Betty and Burns, Paul C.
Roe, Betty; Burns, Paul C.